The US and China have called a temporary ceasefire in their escalating trade war with the leaders of both countries agreeing that no additional tariffs will be imposed for 90 days. 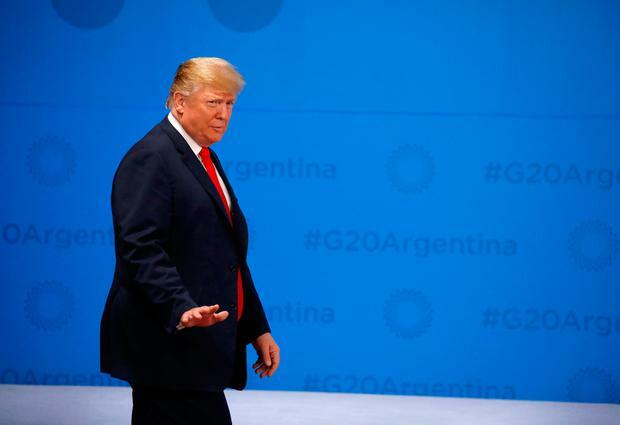 Donald Trump, the US president, and Xi Jinping, the Chinese leader, met for more than two hours at the conclusion of the G20 summit in Buenos Aires on Saturday night. Afterwards, Mr Trump suspended plans to increase existing taxes on $200bn (€175bn) of Chinese goods from 10pc to 25pc on January 1. In return, China will buy a "very substantial" amount of US goods, according to the White House. Beijing also agreed to start talks on structural changes related to intellectual property protection and cyber theft, both key issues for Mr Trump. The development came as it emerged last week that exports of US soybean to China were down 94pc because of the harsh trade policies. Speaking to reporters on Air Force One as he returned from Argentina, Mr Trump heralded the détente. "It's an incredible deal. If it happens, it goes down as one of the largest deals ever made. "It's a deal between the US and China made by the president and the president. And it'll have an incredibly positive impact on farming, meaning agriculture, industrial products, computers - every type of product. "And what I'd be doing is holding back on tariffs. China will be opening up. China will be getting rid of tariffs. "And China will be buying massive amounts of product from us, including agricultural from our farmers - a tremendous amount of agricultural and other products." The dinner meeting was the first time the two leaders had met since the start of the trade war earlier this year, when Mr Trump complained China was doing nothing to cut its large surplus in bilateral trade. A statement from the White House said China had agreed to purchase "a not yet agreed upon, but very substantial, amount of agricultural, energy, industrial, and other products from the United States to reduce the trade imbalance between our two countries". Yesterday, China's state-run media hailed the "important consensus" struck, but did not mention the 90-day deadline on further talks. As part of the deal, the White House appeared to change its stance on tying the trade talks to security concerns, such as China's territorial ambitions. In a long-desired concession pushed for by the US, Mr Xi's government is willing to label fentanyl, the deadly drug at the heart of the US opioid crisis, a controlled substance. "I think this [deal] is not a breakthrough - it's more of avoiding a breakdown," said Paul Haenle, director at the Carnegie-Tsinghua Centre, in Beijing. Explainer: What were the key outcomes at the G20 summit?